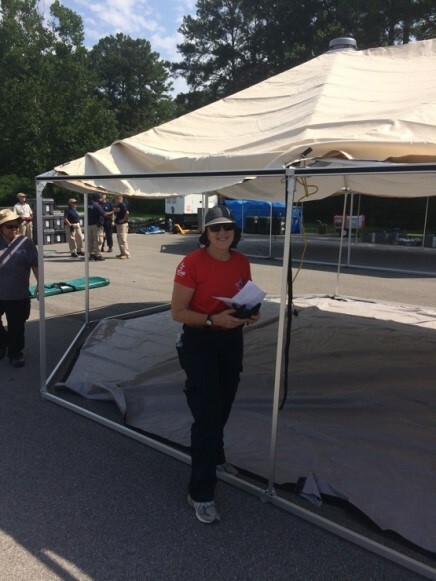 More than 200 MRC volunteers applications from across the country were submitted to HHS for attendance to the Center for Domestic Preparedness Disaster Medical Assistance Team (Fundamentals) training courses in Alabama in of 2018; with only a few selected. I, Peg Clement of Chittenden MRC, feel fortunate to have been nominated for this important training event, and thank my MRC sponsors for their support. 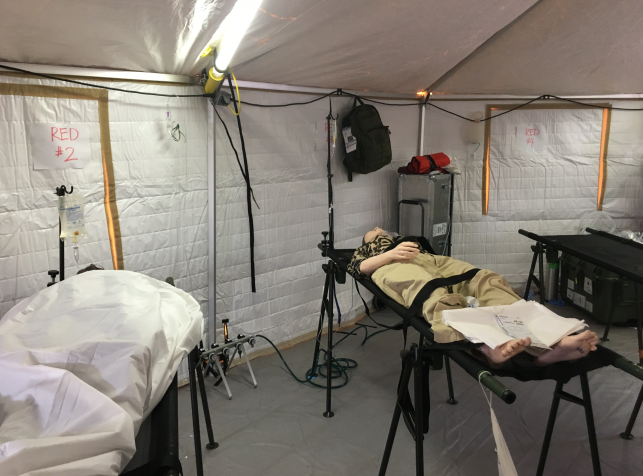 Disaster Medical Assistance Teams (DMAT) are professional and para-professional medical personnel organized to provide rapid-response medical care or casualty decontamination during a terrorist attack, natural disaster, or other incident in the United States. 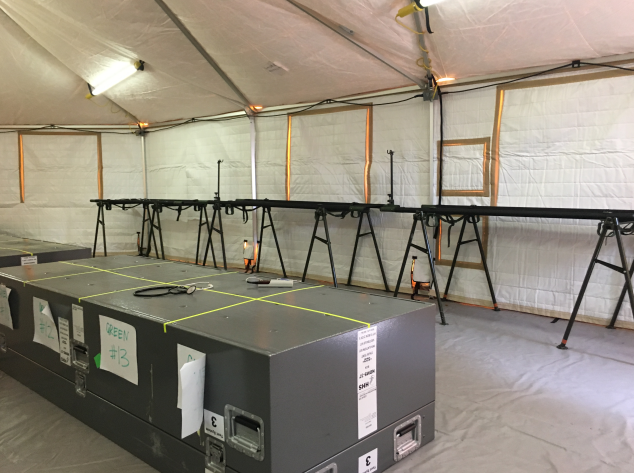 They have provided medical shelters on deployments such has the Haiti Earth Quake (2010), Hurricane Sandy (2012), and the 2017 hurricane season in Texas and Puerto Rico. The training was a 3-day set of lectures (am) and hands-on skillset practice (pm) in preparation for a large Integrated Capstone Event (ICE) on the last day. Most of the 39 attendees were DMAT experienced medical professionals such as nurses, doctors, PAs, medics, public health service professionals, mental health specialists, and pharmacists, but a small number such as myself were non-clinical people from around the US including three MRC volunteers (librarian/RN, fashion merchandiser/EMT, and myself in international aid work), federal logistics and communications employees, and managers. NDMS has only recently begun inviting Medical Reserve Corps participants to their trainings. Below I will provide an anecdotal overview of the content and process of the training, as well as my feelings and feedback on the experience. All participants showed up early in full dress uniform including EMT/BDU pants, boots, caps, ID badges, gloves and tactical backpacks. I showed up my nice red MRC T-shirt, which I proceeded to wear for 4 days straight (needed another! ), and LLBean backpack. I will admit to being fairly bewildered about my presence as a non-medical participant, and what the training was about; I had received very little orientation materials, and there was no on-line training prep. The jargon and acronyms started right away — like another language altogether, and I kept getting hung up on what terms of art meant (embarrassingly, I thought the “M” in NDMS stood for Management. The campus at Anniston is the former Fort McClellan army base, repurposed as the Center for Domestic Preparedness and specifically, trainings. It has a separate “Noble City” scenario area complete with railroad tracks and railroad cars to simulate a derailing disaster, an earthquake fault to practice disaster assistance, a subway that can derail or explode complete with theater smoke, high pressure “gas lines”, tunnels, parks, museums, a stadium for thousands of people, a fertilizer depot for explosions, a river running through it, a hospital, real actors screaming with injuries, sirens, mannequins in all states of injury, and more. Very impressive. 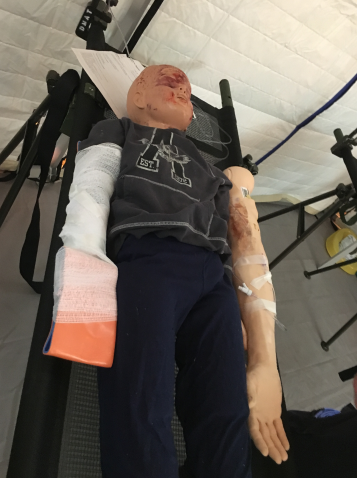 This week’s training was about: Learn the command structure, and the medical skills and equipment, and learn to put up a Base of Operations shelter/tent system, then go through a live scenario with townspeople acting as injured (and dead) victims of a large explosion at an “international banking conference”. OK, game on. Morning was spent taking a class photo, welcomes, introductions of instructors (but too many acronyms), and a module on Responder Safety followed by the NDMS Operations and Organizational Structure Module. These were Power Points. Two more PP Modules this morning included Logistics Organization and BoO Considerations (this was when I had no clue what a Boo was), and Disaster Medical Information Suite (electronic medical records). Afternoon had us working in small participative groups on EMR, ISTAT, glucometer, mobile lab tests, mobile Ultrasound, Thomas Pack, EZ-IO, CAT, Tourniquet, Airway Bag, Vent, Quicktrach, Pulse Ox, and Zoll Propaq MD. More alphabet soup, but I found these VERY interesting – such as actually drilling a needle into a plastic tibia and putting red Gatorade as blood into little measuring valves. Very efficient; I was excited. The time management was excellent. The heat was fearsome all afternoons from here on in, with almost 100% humidity. At 5 pm each day we stood at attention for the flag lowering bugle play. The morning was once again PowerPoints, this time including a 15-minute video by Western Shelter on the set up of their tent systems with no tools — excellent. The presenter, Jean Louis Gomes was a pro, and I bonded with him over his background being raised in Senegal and Cap Vert. A woman from Michigan’s Disaster Responder Team gave lists of considerations for personal gear when deploying to a calamity for up to two weeks. Another instructor presented on medicine considerations for disaster settings: VIP casualties, patients needing isolation or quarantine, chronically ill, elderly, quadriplegics, diapers, behavioral issues, bariatric supplies, service animals. Very interesting! More talk on the tent set-up, which will happen tomorrow before Day 5’s big ICE. Don’t set them in a low area, where is the ingress and egress, patient flow, a landing zone for helicopters, where to put any corpses, and what if scenarios: vomiting, blood, codes, unaccompanied minors, etc. The skill set practice in the afternoon included site safety, water systems and latrines and showers, EMR, litters and cots and mosquito netting, Charlie Horses, MORE EMR again, and the MLK Augmentation pack. The day was spent putting up the tents in a parking lot in “Noble City”. These were both outside structures (in the relative cool of the morning — 90s), and the inside “build-out” inside the tents (shade!) including supplies, shelves, electricity, HVAC for AC, etc. The heat was a huge factor; I put down 4 bottles of water in 3 hours (we were told to keep the bottle tops in our pockets to count how much water we had drunk!). I was assigned to the Triage tent, and was to play the role of registration/intake and data entry into the Toughbook laptops. Our small team of a couple medics, an Xray tech and me then installed a couple shelves, rubbermaid boxes as chairs and benches, some first aid supplies. An evening lecture went over PTSD felt by disaster responder professionals — “we need help worse than we think.” Rising rates of suicides among cops, fire fighters, EMS, DMATs. Teams need to debrief in order to destress. Over the next 4 hours, some 76 “patients” came through our triage doors and I had to get their names, ages, chief complaints, allergies, medications, photos, and make them an ID blanket on this little printer machine. People were running everywhere, and then we’d get slammed by a woman having a miscarriage on the room floor (fake blood as “contamination” to deal with…). I quickly learned the difference in green, yellow, red (or urgent, non-urgent, emergent, expectant), and other buzz words like rapid encounters, critical care, walking wounded, and I even learned that ponies are used as service animals sometimes! The hotter-than-hot afternoon was spent tearing down the whole operation (almost 3 hours with heat breaks near the trees), folding up tents and stuffing them back into the “coffins” while the LRATs helped us load these heavy boxes into two trucks. It was a terrific week. I was operating at the outside edge of my skills, capabilities, and knowledge, and was pushed my comfort zones each day. I found I would like to explore ways to join medical response teams, and even try to deploy in the coming years. For example, we were told that week there is a call for deployment right now to the Texas border for Spanish speakers to come help with the separated migrant families.